Time to look back at a year of drawing. I spent yesterday compiling this video, complete with soundtrack, courtesy of Josh Woodward. It’s really beautiful and adds feeling to the random, mostly chronological succession of sketches. It’s a great exercise though, this compiling thing, because it helps me to see a year’s effort in a flash. I keep a rough count in my sketchbooks as the year goes by, and 2014 came in at about 1049 drawings, substantially more than last year, which I was not expecting. The burnout and depression of late summer really slowed me down. When I look back, there’s was more joy and excitement last year, I think; more ambition and determination this year. 2014 was also the first full year of daily drawing. I wonder what 2015 will bring? I’ve dealt with the issue of burnout my entire life. Obsession and burnout, a great whirling wheel. Suddenly, all the lights come on at once, life feels wonderful, I feel young again, take on too much, with great enthusiasm and ambition, manage for about 18 months, then crash. Usually takes me a few years to recover; hopefully I do better this time.The black depression only lasted a few months this summer, and with the worst of it past, I’m hopeful again. I’m still drawing (almost) every day, but usually just little doodles, nothing worth sharing; I haven’t got much spirit for it. As for the writing, I’m reading some stories I wrote about 4 years ago, tinkering a bit as I go, and that’s been interesting, to say the least. It’s almost, at times, like reading the work of someone else.To build a world and live in it as I write is the greatest creative pleasure I know; I do hope I can get back to it again. I just don’t hear the voices. That’s my news. If you like checking in to my site, thanks! I hope to have new content again soon. Steady work this week, nothing much extra, nothing standing out from the crowd. On a few occasions, I tried drawing in a swifter, sketchy way rather than my slow, careful lines, but have mixed feelings about the results. I like the watercolor/marker combo from yesterday and would like to have done more of that today, but I was painting walls instead of drawings. Satisfying, but not good for the drawing practice. One project that was very satisfying, and informative, was a total review of all the drawing I’ve done for the last 36 years, which meant leafing through every sketchbook, drawing pad, journal and every pile and box of drawings. There were old animation class projects, little cartoons my sister and I used to send each other n the mail, studies for portraits I did on commission (dogs even!) and tons of studies from Old Masters. Comparing then to now, I was bolder, more imaginative and daring when I started, but I was missing some major skills. I can draw as well in markers now as I did with pencil all those years ago and I’m a bit more sure of anatomy, but there’s a lot of loss. I once was accomplished with watercolor and ink drawing, and I’ve lost both those skills. I used to paint in oils, too; the last one I did was 25 years ago, but I had never gained a lot of skill there. I used to plan paintings from my sketches, going through composition studies, testing colors, but aside from thinking about how I might take my suit-guys further, nothing much has happened. Over three decades of mostly menial jobs have taken their toll. It’s hard to be serious or excited about my work….but I want to be. Still, it’s a body of work with a direction in figural art and portraiture with a side line of storytelling. And I can’t forget that most of the last 14 years, my focus has been on writing. And then there was the film studies in the 80s, grad school in the 90s… lots of other competing interests. I’d be lying to say they were all lost years.There were some profitable ideas back there I want to pick up again, and I’ve learned a lot recently that I’d like to put into practice. Time to prepare for art’s second half in my life. Another 36 years would take me to 90, and that would be a very fair go. I sure hope I can make more of those years than I ever did with the ones that are past. So the moral of the story is this: Kids, don’t let this happen to you. Don’t listen to the people who try to scare you into being like them, scare you away from risk. There’s always risk. The time is never prefect. You have a right to try. Fail at what you love rather than at everything you don’t give a damn about. Don’t be like me. That thing you want to do? DO IT! That’s what I learned growing up. We had to wash our hands before picking up a book. While singing, reading and other disruptive hijinx were not allowed at the dinner table, whether one was finished eating or not, because everyone stayed till everyone was done, the parental response to one of our questions was always “Look it up!” Oh joy! “Look it up” meant a free pass to get up from the table to consult the necessary volume of the encyclopedia—or dictionary, if the question was about an unknown word—and then enlighten everyone on the issue. That “look it up” dictum has become an ingrained habit, one I am very pleased to have. In my childhood home, the World Book Encyclopedia, tidy red books with glossy pages and gold stamping on the spines, resided behind glass doors in the corner hutch in the living room. Many a first-day-of-school photo was posed in front of it. My favorite volumes were CL-CZ, P and F, inside which I could find Costumes, Painting and Flags of the World respectively. Man, I loved the illustrated pages of historical and national costumes, and drew copies of quite a few of them. I never considered drawings like that to be art though; Art was to be founding the Painting section. For middle class 1964, the Painting section was pretty up-to-date: it included the classics, stuffy and brown and hence uninteresting, or contemporary work, which had the virtue of being colorful, but seemed little different than preschool daubing in my child-opinion. 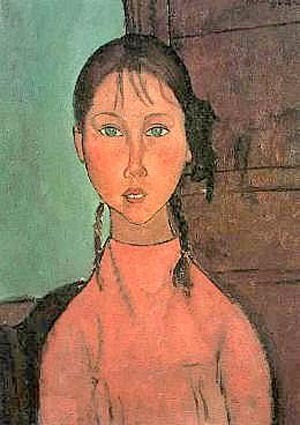 Modigliani’s Girl in a Pink Sweater also couldn’t be Art, though it was featured there; after all, its simple forms and skewed features did not seem marvelously out of the way of my own drawing style. (I thought maybe this meant I’d be a famous artist one day.) But Sargent’s Madame X was something else entirely. Madame X was the first painting I ever loved. I love it still. I love her haughty elegance, the risqué gown, the subdued shadowy palette, and of course, the virtuosity that is in everything Sargent ever touched. I’m not sure what it was about the painting that made me love it as a child, probably just the sophistication of the woman or maybe the black velvet of her dress. There was a lot of velvet to be seen in the Sixties and I loved all of it! But the child-memory that lingers includes a feeling for this woman, standing alone in a vast dark space, infused with light from who knows where, looking resolutely outward at who knows what. It was an exalted expression of the way I felt life to be, such as I knew it then. It moves me still. Fernand Khnopff was a Flemish portrait painter active at the turn of the 19th century. I discovered his work in The Portrait of Jeanne Kéfer, a book available as a free digital download from the Getty Museum. Daguet’s analysis of the Kéfer painting is good, but I didn’t care much for his overstrained theoretical arguments. Still, it’s an interesting peek at the fin-de-siècle Flemish art scene and the way it connected with trends in France and England. Definitely worth a glance….as are many of the other titles in the series. Degas: Waiting, for instance, was excellent. Khnopff was a portraitist who dismissed photography as an art form, but used it as a tool in his painting. I’ve been thinking about photography too, lately. 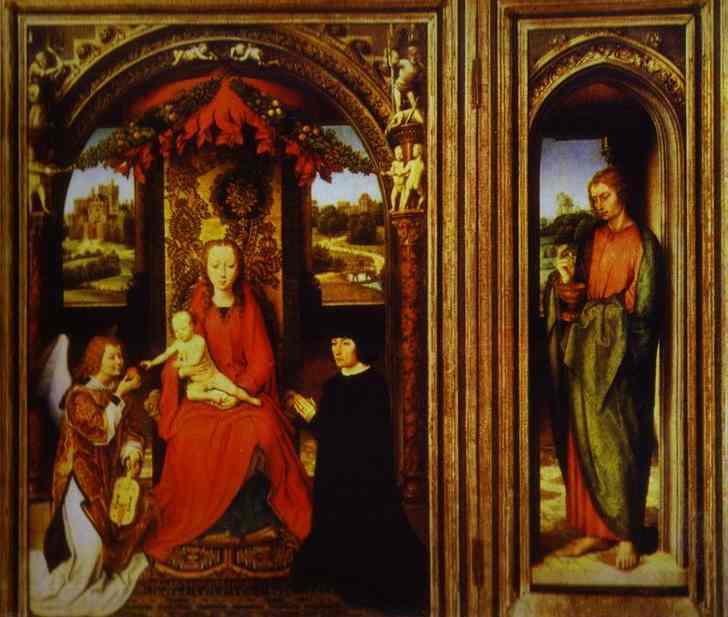 His was a form of Impressionism influenced by rough-hewn modernist techniques and the luminous precision of Memling. Perfect. Khnopff’s work appealed to me right away. What has been unexpected is the appeal that his subtle, pale palette has for me. I generally prefer an intense kaleidoscope of color; it must be the monkish side of me surfacing, I guess. Still, I’ve been looking at a number of things lately with more subdued palettes: the coloring in Mignola’s The Amazing Screw-On Head, the subtle hues, textures and patterns in classic menswear styling and the harmonious pales I like in beach home interiors. Quidditch reveals all…or does it? That’s Cram discoursing on one of the few things he likes about public education in America and Britain, c. 1922. Believe me, he didn’t like much; and interestingly, in the intervening 92 years, schools are still bad in a lot of the same ways they were then. Cram was a religious-minded architect who built Gothic-style churches and university buildings in the first years of the 20th century, and I came to his writings while researching a restoration project that had come to an architectural firm I was working for at the time. He is extremely insightful in his diagnosis of the ills of his (and our) era, and well worth reading for that, though I can’t say his solutions were too practical, but I think he knew it. As I read this comment though, the Harry Potter books sprang to mind, but then, a lot of things remind me of Harry Potter. Just wait till I start talking about David Copperfield! Harry Potter gains popularity early on in the series when he takes up Quidditch, a sort of irrational, flying rugby on broomsticks, for which he has a natural gift. The books have been criticized for the centrality of this goofy sport in the lives of the entire wizarding world from student to the highest levels of govenment, but those critics must never have lived where the fortunes and failures of the local football heroes provided the social and emotional core of a community. Or maybe they wished they didn’t… Even Rowling supposedly rued the day she injected Quidditch into the books, primarily because she found it tedious to try to conjure exciting action for each match that she wrote, but sport was always a part of the boarding school book tradition from which Harry Potter sprang, so there had to be a wizard equivalent. QED Quidditch. So how do the characters in Harry Potter demonstrate Cram’s ideas? Most of the characters played Quidditch; it was a huge social factor in the school. Excellence in studies… less so. Sic erat scriptum Hermione. I was the same. Harry Potter, our erstwhile hero, came from obscurity to discover he had the makings of an athletic superstar. In Cram’s terms, this was a literary sign of his character and potential, and the books proved this out. His parents had risked their lives to save others and he grows up to become the same sort of man. Harry’s nemesis, Draco Malfoy, was also a skilled player, but his lack of character was made plain in his cheating, lying and generally underhanded methods of manipulating the game. His father, acting in the world of politics, operated in the same way. Harry’s buddy, Ron Weasley, had enormous potential when his self-doubt didn’t cripple him, which it mostly did. That was the view of the world his parents had taught him to see–poverty standing in the way of active participation and serving as an excuse for weakness and shortcuts. Exposed to stronger personalities like Harry, Hermione and Neville, Ron has a chance to grow, but his path is often an unhappy one. The only character that stands apart form this paradigm is Neville Longbottom: an orphaned loner who struggles for success in everything he attempts, Neville never played the sport, but nonetheless became a hero of the same stature as Harry. And with less outsized praise and more dignity, for my money. Me, I was never very good at school athletics; I was not encouraged in it at home–and how many girls were, back in the day?–but I wanted to be a part of it, I wanted to get better, but mainly it was just the catalyst of anxiety attacks. Small wonder that Ron Weasley was my favorite from the books. But since athletics was not going to be the way for me, and surely cannot be anymore, perhaps I ought to study the Path of Neville. Own my differences, judge for myself, enjoy the victories of my friends. Maybe we all should. Yet another storm is wheeling across the East leaving a blanket of snow. It’s making for a peaceful snow globe Sunday. One of my neighbors cleared my sidewalks for me without being aware that I’m nursing a throbbing molar and Gus was excited to go out and play in it. All to the good. Still, it is March and I’m ready for green things and flowers and blue skies. The birds had even begun to sing last week, but all is silent now. I’ve been mainly hiding inside, reading one of my favorite blogs, Alicia Paulson’s Posie Gets Cozy. I’ve been following her blog for about 6 years, but I’ve not kept up all the time, so lately I’ve been reading through her archives from the beginning. It’s interesting–and inspiring–to see how it has evolved both in content and the beauty of Alicia’s photographs. It’s ostensibly a craft blog and I’m no crafter–though she makes me wish I was–but it’s more than that: what draws me back is her eye for beauty–in nature, in handmade things, in people and the everyday world around her–and the kind, open personality she projects. You get the feeling she’s the sort of person you would like the moment you meet her. I always look forward to her posts, just the way I used to anticipate getting letters in the mail from my sister or my friends. Hurrah for the Internet! I’ve been messed up with rotten teeth and trips to dentists, pain meds and root canal appointments, none of which have helped me be very productive in the drawing department. During the week, I stuck with my own face for subject and drew in pen and marker. Simple. The photos are from last fall; I might have needed to embellish newer ones with a pink bulls eye on the left cheek and red cartoon lines radiating from it. Today is also the anniversary of my first year of drawing every day. I’ve set myself this goal many times before, full of enthusiasm, but I’ve finally managed to do it. I think I’ve learned perseverance as the years have rolled by; I’ve never been good at pushing on when the work was lousy or boring. I plan to keep going for as long as I can now that I’ve made this a part of my routine, maybe indefinitely. It’s instructive–working this consistently. I’m learning how to weather the bad drawings and keep going; getting used to the waxing and waning of my energy, enthusiasm and progress; and forcing me to create strategies for getting a drawing done, even with a 10-hour job interruption five days a week. (I like stealing a few minutes in the morning before I run out to catch the bus the best.) While I am still an amateur, of course–drawing isn’t my job–I feel less like a hobbyist. I am conceiving aspirations that I begin to hope I can meet. It’s been an interesting road. A self-portrait sketch from my first year in grad school. I found that drawing gave me a much needed stress break from my studies, and from time to time, offered up some insights. You know that experience when you repeat a word till it sounds like gibberish and you truly lose the sense that the syllables have meaning to you? Ever done it with a mirror? Now that’s a trip, brotha, that takes you to a whole ‘nother place. This drawing was from such a moment. This isn’t a post about playing games on Twitter, so if that’s what you are looking for, keep searching. What I’m thinking about is the aggressive quest for Twitter numbers. I’ve gotten some, I suppose, well-intentioned comments encouraging me to Follow all my Followers or no one will share my work and I will have no audience. Well, that may be true, but considering I am posting this missive to a blog that at best gets 7 reads, winning the popularity contest is not really that high on my priority list. Obviously. I’d like to think that the people who Follow me on Twitter do it because they like my work or maybe like the things I choose to share from other feeds–that’s why I follow the ones I follow. It’s not bribery; it’s feeding my mind on the pleasures of the kind of intellectual companionship I love the best. Now, I admire a man-with-a-plan as much as anyone, but in this part of my life, because my work means so much to me, I don’t want to lean on strategies and gamesmanship. I want the work to stand on its own, or even fall, if that’s the merits of it. It could be that I am thinking about this all wrong, and I’d be interested to hear some opinions on the matter, but for now, I am happy with my tiny, yet honest, market share.